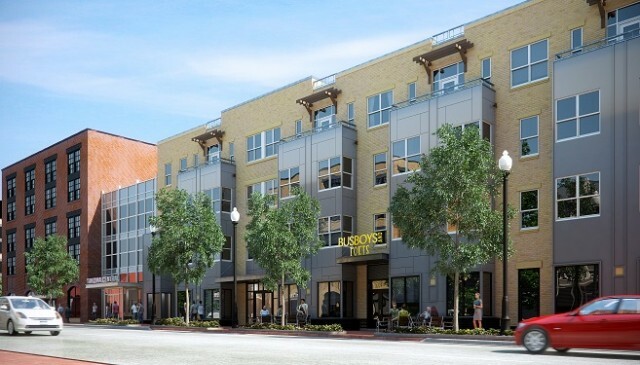 “Federal Capital Partners® (FCP) and Level 2 Development (Level 2) have begun leasing Takoma Central, a new, green apartment community featuring 150 studio, 1 and 2-bedroom apartment homes in the Takoma neighborhood of Washington, DC. Takoma Central is located at 235 Carroll Street, NW, just steps from the Takoma Red Line Metro station and many unique restaurants and eclectic shops in Takoma’s historic main street district. Takoma Central was designed to complement the architectural character and spirit of the Takoma neighborhood and to promote a healthy, sustainable lifestyle for residents. Destination restaurant Busboys and Poets will occupy Takoma Central’s first floor corner at Carroll and Maple Streets. Bozzuto Management will lease Takoma Central from the initial leasing office across the street from the building, at Trohv Home & Gift at 232 Carroll Street, NW. Interested prospective residents can contact the leasing office at (202) 888-2387 Monday through Friday from 11:00 am until 7:00 pm. Takoma Central apartments feature open, airy floor plans, sophisticated finishes and welcoming, comfortable social spaces. Residents will enjoy a fitness center, resident lounge, courtyard, business center, social e-cafe and an automatic package concierge.